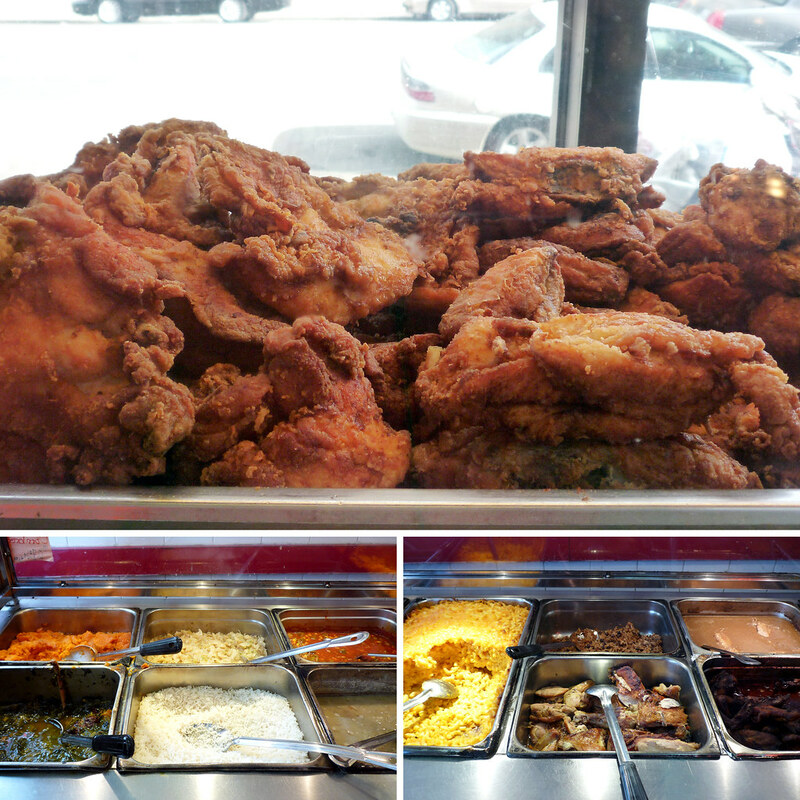 In this solo dining adventure, Gary treks up to Harlem for southern food at Charles’ Country Pan Fried Chicken. Top – Fried chicken sits, waiting for hungry folks to eat them. Bottom left and right – the many buffet options. While attending college in Binghamton, NY, Aaron, one of my new suitemates sophomore year, kept talking about how we had to go this really great southern food spot. Theo’s Southern Style Cuisine, located about 10-15 minutes from campus, was this little dive of a place that served as my first true exposure to southern food. They had a great buffet on Saturday nights and an amazing brunch on Sunday mornings. I attribute a good portion of my weight gain during my college years to the many enjoyable meals at Theo’s. My only regret is that I never had their fried chicken (though I did have their fried turkey – really tasty) since it was never on the buffet, at least not as far as I can recall. Another bit of sadness – I haven’t had real a southern meal since my last visit to Binghamton in 2003. I’d chosen instead to wade into the burgeoning barbecue scene in New York City and hadn’t really given much thought to southern food in the last six-plus years. My accidental abstention from southern food would finally come to an end on a Friday afternoon in March. As I had unintentionally avoided it, my first time having southern food in years happened, well, unintentionally. What originally started out as an ill-fated discussion into a group attempt at the Hill Country “Feed Your Face” Challenge (it didn’t happen, it’s Hill Country’s fault – ’nuff said) turned into a group outing to Charles. Honestly, I am so much happier to have stuffed my face with fried chicken than barbecued meat. 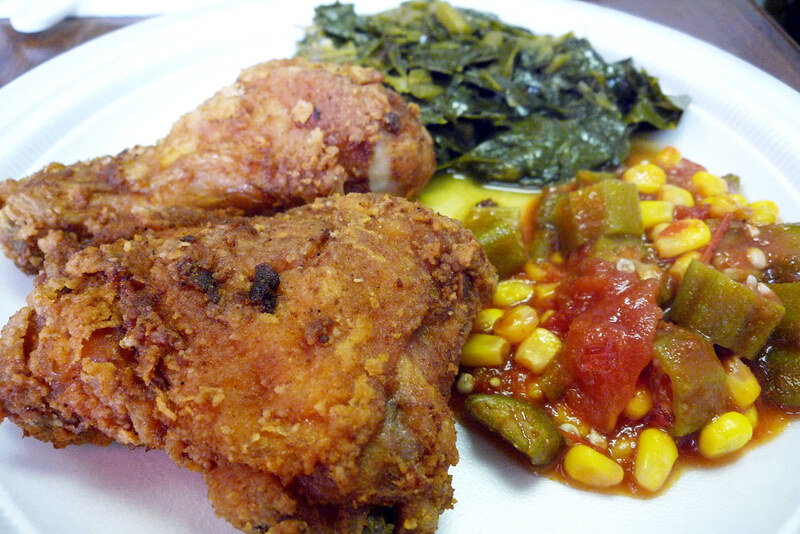 My first plate – some fried chicken, collard greens, and okra succotash. Wanting to last for as long as possible, I started small with my first plate, choosing only to grab a drumstick and thigh along with some collard greens (it’s not southern without collard greens) and some of the okra succotash. When it comes to fried chicken, for me it only takes one bite for me to be able to form an opinion and in this case I loved it. The skin was thin, crispy, and dry (in a good way, i.e. not soggy) while the meat underneath was moist and juicy – it’s the way fried chicken should be. When we got there, the chicken had been sitting in the case for some time, seemingly with no ill effect on the chicken. That might have to do with the fact that this case was pretty hot – not as hot as an oven but it felt warmer than just the residual heat of the chicken. It certainly wasn’t reminiscent of fast food fried chicken and the insidious heat lamps they sit under in a vain attempt to maintain crispiness. Speaking of vain attempts, the rest of my first plate consisted of two vegetable sides which I facetiously dubbed the healthy portion of my meal. Of course, that’s an absolute lie when you consider that the collard greens are cooked with plenty of fat and smoked meat to impart additional flavor. Not that I’m complaining, mind you, because I loved every second I was piling the greens into my mouth. It’s definitely some of the best collard greens I’ve ever had. The okra succotash was also delicious but you’d have to like okra to enjoy it. The collard greens had enough going on that it might make you forget you were eating greens but the okra is unmistakably okra. 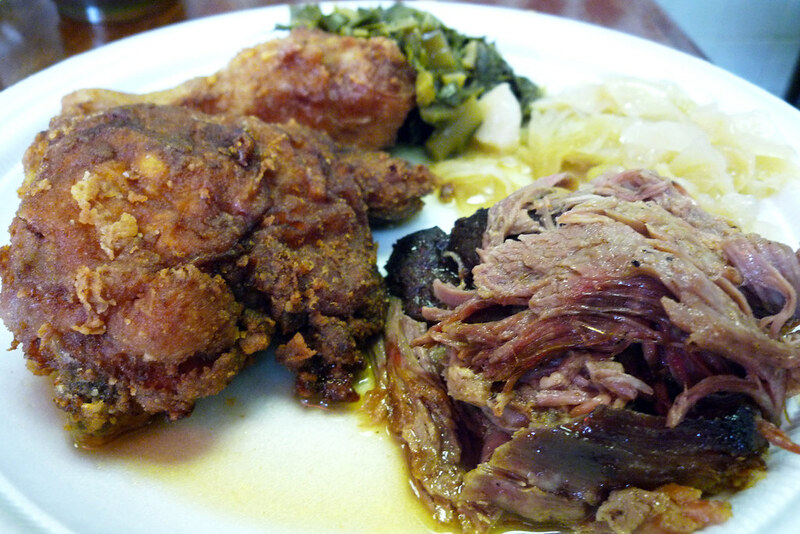 My second plate – more fried chicken, more collard greens, sauteed cabbage, and pulled pork. For my second plate, I decided to load up since it seemed wrong to have to keep using a new disposable plate each time and not utilizing the space to its fullest. More fried chicken (drumstick and thigh, yet again) and collard greens while also adding some sauteed cabbage and pulled pork. The cabbage had a surprisingly and refreshingly clean taste; for some reason, I just thought I’d be getting more fat and meat flavors in it. The pulled pork had been sitting in an oily broth and was merely okay. I’ve certainly had better pulled pork in New York City. The pulled pork would also turn out to be the only meat I would have that wasn’t fried chicken. I was already starting to get the meat sweats and I wanted to purse eating no other meat besides the fried chicken. To that end, my third and fourth plates consisted of two pieces of fried chicken each and minimal sides. By the time I was eating the chicken on my fourth and final plate, I had the thousand-yard stare of a man who knows he’s wounded and beaten. Somehow, I managed to power through and move on to the banana pudding to cleanse my palate. If you don’t mind going north of 96th Street and you love fried chicken, you need to set aside a few hours to fully enjoy the all-you-can-eat wonderfulness of Charles’ Country Pan Fried Chicken. At $10.99 for a weekday lunch buffet (only $3 more on a weeknight or all weekend), it’s a real bargain especially if you pig out like I did and eat eight piece of fried chicken. The buffet options are numerous and all looked good (except the mac and cheese for me but I don’t like cheese) but make no mistake, you’re here for the fried chicken. To get full on anything else without eating your weight in fried chicken almost seems like a crime. While you’re setting aside a few hours to eat here, you may want to consider setting an almost equivalent amount of time to walk your meal off. Our group walked for over an hour from the restaurant to Columbus Circle before I left and hopped on a train yet I still felt ridiculously full. Charles’ Country Pan Fried Chicken. 2839 Frederick Douglass Boulevard, New York, NY 10039. [Show/Hide Map] (212) 281-1800. Very nice Gary —- There is always the danger of being derailed by sides, especially if that includes smoky,vinegary collards, so it was smart of you to concentrate on the chicken. Sounds like the perfect spot to fuel up for a long walk. If you head back up to Harlem give “Amy Ruth’s” a try (if you haven’t already) it’s on W.116th between Malcolm X & Adam Clayton Powell — it’s open 24 hrs. on Fri.& Sat. Also stop by “the redhand” on E. 13th just off of 1st Ave. Both have excellent fried chicken. You’re doing the peoples’ work Gary. Keep it up.